After a week in the land of songs and soft shoes, Barry & Co. return to the very grim task of trying save Iris from her fate at the end of Savitar’s giant claw. Even the excitement of free Hamilton tickets turns into stern, knowing glances between Barry, Iris and Joe, when they learn going to the show requires making plans for after Iris’ date with destiny. Against this backdrop struts this week’s villain, Abra Kadabra, a murdering mischief maker from the 64th century. Kadabra represents more than a monster of the week, because in truth, he’s the latest test of Barry’s heroic nature and decision making. Once again, this is a test that Barry ultimately fails. It’s not that Barry’s intentions have ever been anything but honorable, but they are often made murkier, either by Barry’s selfishness (creating Flashpoint by saving his mother) or his overwhelming desire to take shortcuts (his plan to have Wally save Iris from Savitar). Given his knowledge of the future, Kadabra holds Savitar’s true identity over Team Flash’s head as a bargaining chip against extradition to Earth-19, and certain death at the hands of The Collectors. The only person who has a lick of sense about the situation is Iris, who along with Catlin, actually gets some meaningful scenes this episode, which frankly save this chapter from being a complete dumpster fire. For Iris the choice is easy, and quite heroic. She’d rather suffer at the hands of Savitar than see the murders Kadabra committed both on her own Earth and on Earth-19, go unpunished, and Kadabra set loose to potentially kill again. Barry and Joe are more conflicted (and desperate) that it’s Joe who takes Kadabra up on the deal he proposes, and sets in motion the events that lead to the episode’s big Caitlin cliffhanger. Kadabra’s plans to return to his own time are ultimately thwarted by some nifty teamwork between Barry, Wally, Cisco and Gypsy. The concept of working with his teammates to solve the Savitar problem still eludes Barry, and his decision to go against Jay Garrick’s orders and run to the future feels like another ill-conceived shortcut that is sure to make the whole situation murkier. Much of the rest of the episode was dedicated to Caitlin. She tries to repair her relationship with Julian. The overtures are amplified after Caitlin is seriously wounded in an explosion caused by Kadabra, and even though letting her powers save her is an option, Caitlin chooses to guide Julian through the surgery, herself. 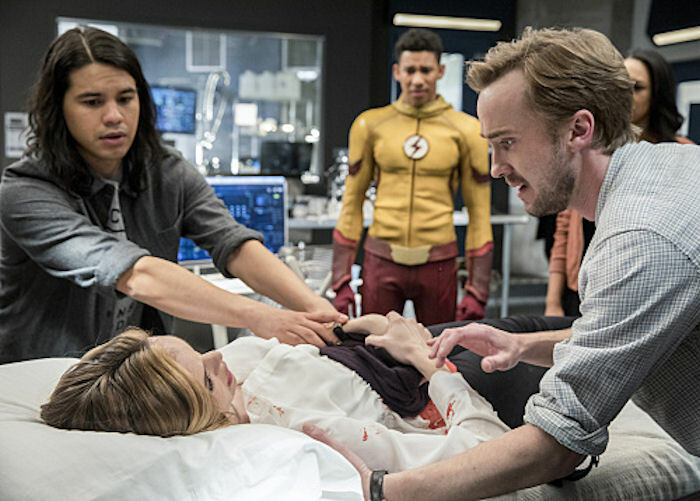 In the extended kicker at the end of the episode, Caitlin does her best “Laurel Lance out of left field” death scene. When Julian, Cisco and HR fail to revive her, Julian rips the power-inhibiting necklace off Caitlin, which does save her life, but the side effect is that it unleashes a very pissed off Killer Frost. The hope that The Flash would inject some of the lighthearted spirit that made the musical crossover so effective wilted in the toxic environment of the Flashpoint storyline. Even Cisco’s constant flirtation with Gypsy was stonewalled, leaving the episode in such a mirthless, brooding place that even the writing staff of Arrow would be jealous. Previous story Can Stephen Colbert Make Sense of Trump’s Russia Ties?